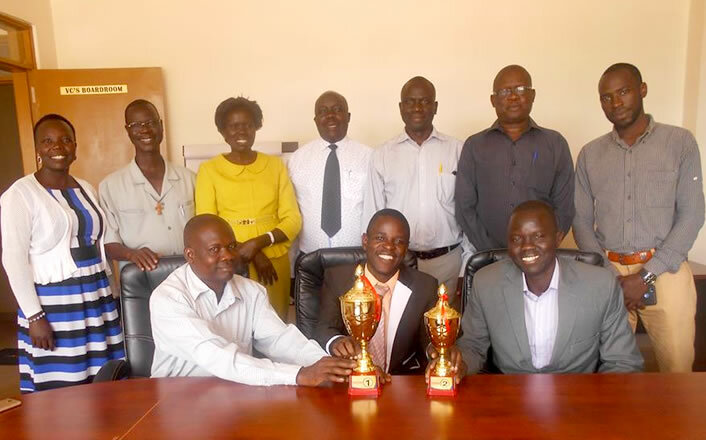 Two students of Muni University Sserumaga Enoch and Tumwine Edson of Bachelor of Education beat all odds to become the best students taking position One and Two consecutively in the National Mathematics Contest. The National Mathematics contest is an event that takes place every year attracting contestants from various Universities in the country. This year for the very first time students from Muni University took part in the contest and emerged winners taking the top two positions. The theme for this year’s contest was “Embracing Mathematical Diversity towards Transformation”. According to the Coordinator Uganda Mathematical Society West Nile Region Mr Isaac Latibo, the contest that took place at Makerere University from April to May 2018 attracted 48 students and 5 Universities ie Makerere University, Kyambongo University, Gulu University, Islamic University and Muni University. He thanked the Management of Muni University and the Lecturers saying there’s always a teacher or a Lecturer behind the success of a student, before handing over the winner’s trophies to the students at the Vice Chancellor’s Board room, Muni University. Sserumaga Enock the best overall in the competition who shared his experience during the handover event says this contest encourages critical thinking which is very vital even in our daily lives and for handling problems in the society, he intends to motivate those pursuing mathematics who think it is a problem to like the subject. The Vice Chancellor Muni University, Professor Christine Dranzoa congratulated the students upon their success saying she was extremely proud of them for being capable of making high level decisions because to compete or not to compete is a personal decision. She recognised and thanked Mr Arop Martin, the Head of Mathematics department Muni University, as well as everyone within the Faculty and the Department that came forward to support this initiative. “It is a very motivating arrangement to inspire mathematics, this is truly a demonstration of what Muni University is and shall be, we are going to contest continuously in subsequent years and i would like to see position one to five being occupied by Muni University”. Professor thanked the Coordinator Mr. Latibo saying the Management is extremely gratified by his generosity for stepping in even when they were absent and this is the spirit of togetherness in diversity. She encouraged the Dean of Students to increase the level of student support in all areas to enable them to go out to interact and get energised. “The Best and 1 runner up in this National contest in mathematics are from Muni University, no other institution, so we are a power to reckon with, our Teachers are doing great work, we are going to develop this country with innovators from ICT, Mathematics, Education, Nursing, Agriculture and Business. We have another program running, we have invited applications for a new program- Bachelor of Business Management and Entrepreneurship, let parents encourage their children to apply, this is an opportunity for them, we have also introduced Certificate in French Language for beginners, and CISCO an IT program for School leavers, all these are to enhance our skills and to build capacity within the region, we thank God for lifting us to this level of Glory”. She concluded.